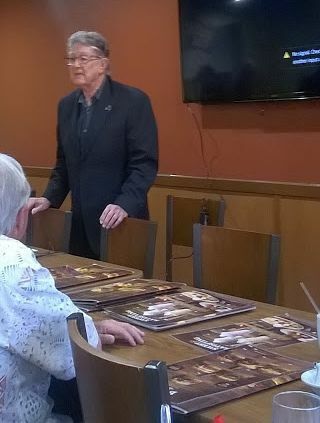 On May 21, 2017, William Tompkins spoke to San Diego MUFON, promising to disclose even more dramatic UFO secrets that are not in his book. Actually this was the third time Tompkins has spoken to that group in the past year or two. I didn't write about the previous times because I felt Tompkins was too marginal a figure, and his book Selected by Extraterrestrials too insignificant to even bother discussing. But Tompkins will be a speaker at MUFON's International Symposium in Las Vegas in July. He is strongly endorsed by Dr. Michael Salla of Exopolitics.org (Salla is also a speaker at the upcoming MUFON Symposium), and Tompkins' highly loopy book is doing quite well on Amazon, its Kindle edition coming in at number 7 in UFOs. So I suppose we must acknowledge Tompkins as a significant figure in today's UFOology. Holy cats the thing went way beyond that [world conquest]. Again, what we just said about this was the tip of the iceberg of what they were doing. Already Reptilians were doing it to other stars’ planets all over this area of the Galaxy. 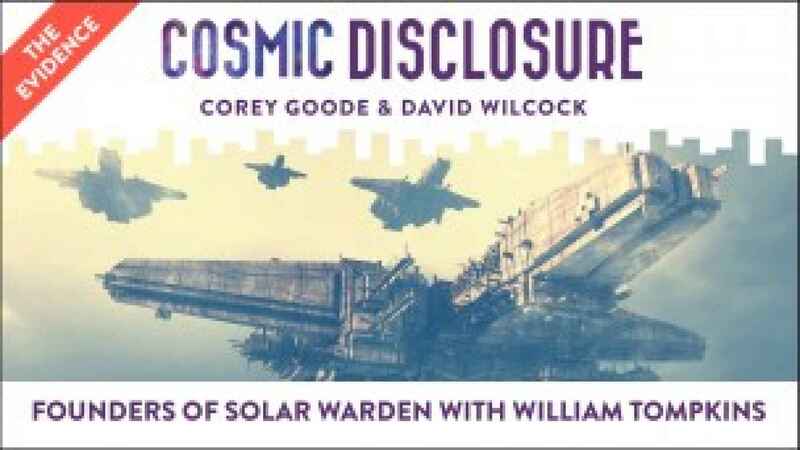 According to Tompkins, eight giant earth-built spaceships of Solar Warden patrol our solar system, and beyond: a "secret space program." Hollywood has been mind-controlling people for decades, using subliminal messages. Some of the manuals delivered to those working on secret UFO programs were written in Egyptian hieroglyphics. He is a Remote Viewer. There are 28 different ways to Remote View. He has gone outside the galaxy using RV. The Reptilians gave Nazi Germany a small fleet of UFOs, ready to fly, to help the Nazis conquer the world. However, the Nazis tried to attach weapons to them, and thus could not get them to fly correctly. The Germans found Noah's Ark, took photos of it inside and out. In fact, there have been 15 global floods like Noah's flood. A few MUFON members challenged some of Tompkins' more obviously bogus statements, for example, "subliminal messages" have been extensively researched and found not to work. In each case, he would be unperturbed and just launch off into some other made-up nonsense, ignoring the question. On the whole, most of the audience seemed to take Tompkins' ramblings seriously. MUFON claims to be dedicated to "the scientific study of UFOs for the benefit of humanity." But in light of the above, how can they possibly call their organization "scientific"? MUFON's executive Director Jan Harzan was recently interviewed by Kenvin Randle. Harzan spoke about balancing the needs of the organization vs. fidelity to sources and scientific accuracy. In other words, MUFON needs to be kooky enough to keep the "unrealists" interested, while being credible enough to keep the "realists" from jumping ship. A very difficult balance! Tom DeLonge's "Sixtyish" Days to UFO Disclosure Become "Ninetyish"
Rocker Tom DeLonge, formerly of the band Blink 182, has been grabbing a lot of attention of late with his claims to be on the verge of releasing dramatic new 'UFO disclosures' that he has supposedly finagled out of highly-placed government and military officials. Because of the buzz this has created among true-believing conspiracy UFOlogists, this year The International UFO Congress awarded DeLonge its "UFO researcher of the year" award. He was not present at the UFO Congress, but submitted a video of his acceptance of the award. Since DeLonge hasn't yet actually published any research, this year's award was something of a "Hail Mary pass," given in hopes that he will follow through with his exciting claims, and release something important. Of course, experienced UFOlogists know that the history of UFOlogy is littered with the busted claims of those who claim to possess, or to know about, dramatic UFO proof that will be released soon - but it never is. In the video below, which was shown at the UFO Congress on the evening of February 15, 2017, DeLonge is described as "seeking to expose a vast UFO coverup within the government." He is said to have based his recent fiction book Sekret Machines, Book I (there is more to follow!) on "information fed to him by government insiders" concerning reverse-engineering of alien technology. He claims to have been authorized to say that he used "sources withing the aerospace industry and the Department of Defense and NASA." Video of DeLonge's award presentation, and his acceptance of it. DeLonge's credibility got a big boost last year when Wikileaks released a collection of emails from John Podesta, a Washington insider who was then the director of Hillary Clinton's campaign for president. Podesta is well-known to be a UFO believer, and all that the emails prove is that Podesta and DeLonge share common UFO beliefs. The most significant matter in the emails concerns a meeting set up on Google Hangout by John Podesta between DeLonge and Rob Weiss, executive VP of the Lockheed Skunk works, Major general William N. McCasland, commander of USAF laboratories at Wright-Patterson Air Force Base, and Major General (retired) Michael Cary, special assistant to the Commander, Air Force Space Command, at Patterson Air Force Base. We don't know what was said during this virtual meeting. We also don't know if these important people participated because of their interest in UFOs, or if they did it as a favor to Podesta. After all, everybody "knew" it was inevitable that Hillary Clinton would be elected president, and Podesta would be an extremely important man in Washington. DeLonge later said that McCasland claimed to possess a recovered alien body, but McCasland has not confirmed this himself. 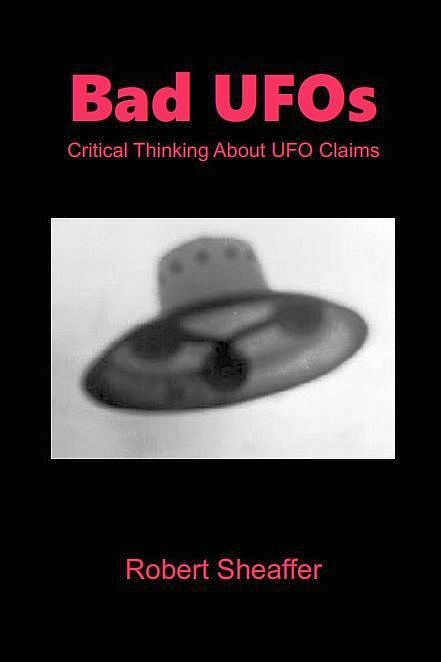 The UFO claims he cites are highly questionable ones, and suggest that DeLonge does not understand the meaning of "critical thinking." He seems to believe every wild UFO claim he hears. Sixty days from February 15 would make April 16 DeLong's approximate target date for his grand announcement. May 16 marked 90 days, and counting. DeLong closed with the warning that his Grand Announcement might not seem like much to the uninitiated. I need you all to look really really closely at the announcement, and I need you to be a part of it. Because what the announcement is about is so much more than it will look like on the surface, and I need you guys to come along for the ride... I want you as an educated group of people to read between the lines, and look at the history of what I've been doing over the last couple years." So the real question is, how credible is DeLonge's account of these developments? While the above carefully-prepared video was obviously crafted to make DeLonge look as believable as possible, other videos show DeLonge rambling on rather incoherently about UFO conspiracies and the Monuments on Mars. It is difficult to believe that any serious government official would rely on this guy to release dramatic, world-shaking secrets, especially since DeLonge has openly talked about being on drugs. Does this guy sound like somebody the government would trust with highly-classified information? On April 2, DeLonge posted to Facebook, "Pay attention to the announcement that is still coming, but sit tight- it will take a few more weeks." On April 23, he posted "Big things coming soon. We are running a few weeks behind schedule, but I believe it will be worth it. 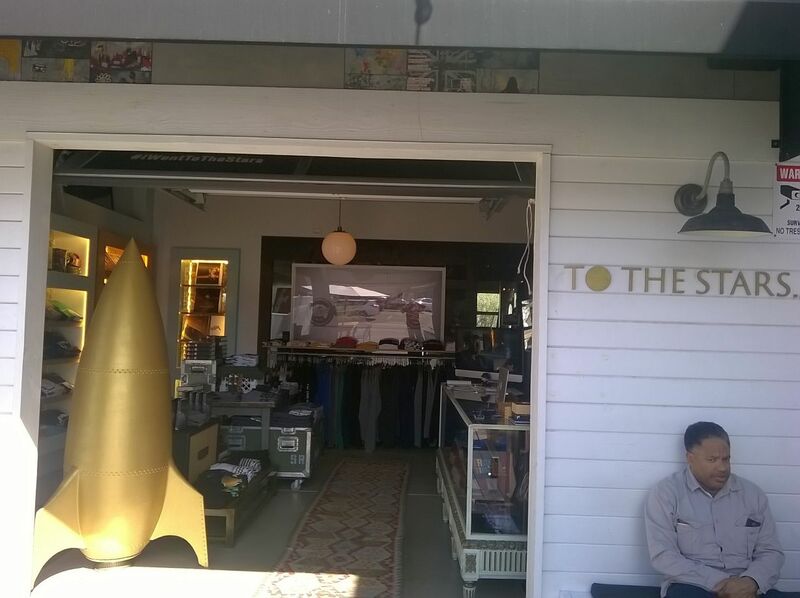 Been working on this for over a year and it wasn't easy, so please bear with me..."
Tom DeLonge's little store in Encinitas, CA, a trendy beach town just north of San Diego. In between a few postings like these, DeLong has been posting a steady stream of minutiae, like where he went or what he ate. And also a stream of advertising to benefit his business To The Stars. 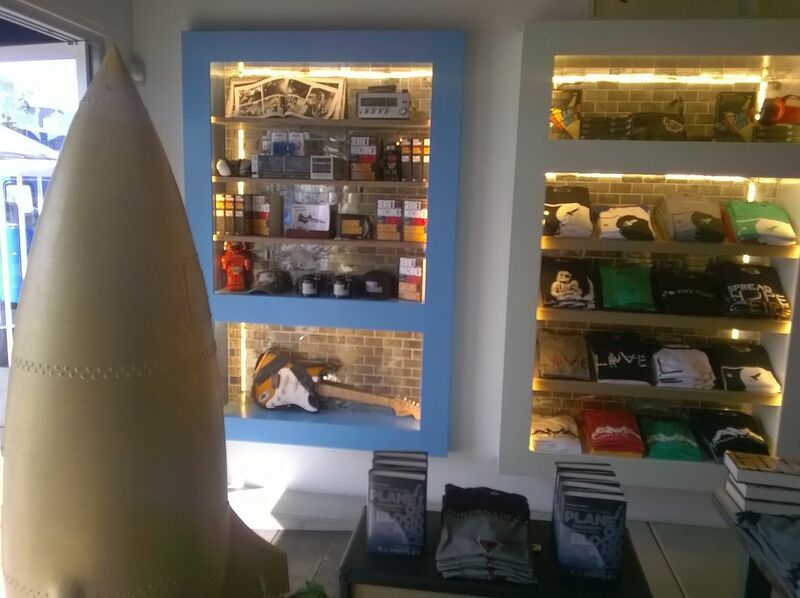 On May 2, DeLonge posted this transparent merchandising pitch to Facebook, "Since it is our anniversary month, we are doing a special #iwenttothestars contest! This month's winner will win this signed guitar. To enter, all you have to do is post a pic of your TTS merch or media and tag us and #iwenttothestars." 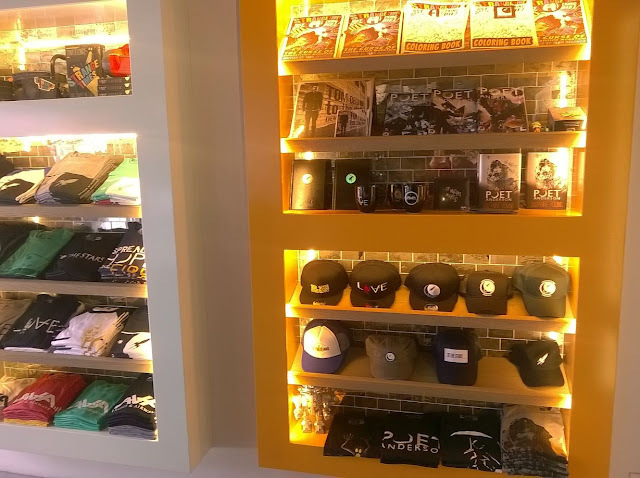 Some people suspect that DeLonge's real motive behind these extraordinary claims is to lure people into his planned publishing and entertainment empire of books and motion pictures. There is good evidence to suggest that the Gonzo Marketing explanation is correct. Mother Jones interviewed DeLonge in its issue of March 21, 2017. MJ: The Sekret Machines franchise comprises three novels, three nonfiction books, a TV show, and a movie, right? TD: Yeah. It will go on for a very long time—most likely it won't be restricted to only three novels or three nonfiction books. It will be multiple nonfiction books, multiple historical fiction novels, multiple major feature films, and multiple documentaries. That's the goal. It will take us many years to do all that, but it's something or multiple things happening every year in regards to that architecture. Think of it like the way they do Star Wars or Marvel films. It's an entertain-and-educate model. In other words, DeLonge's plan is to set up a UFO-related publishing and entertainment empire, alone the lines of George Lucas' Star Wars. As I have not read his book I cannot say whether it is likely to succeed on its own merits. However, it seems extremely dubious that large numbers of people would pay much attention to all these products were they not enticed by DeLonge's promise of Imminent UFO Disclosure!!!! Where else can you buy T-shirts, books, and hats?